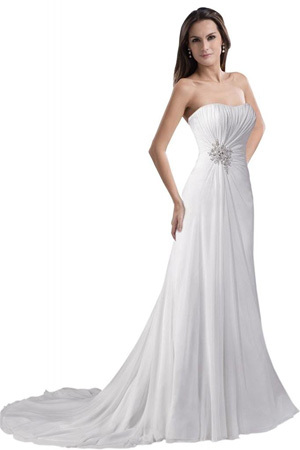 The GEORGE BRIDE Simple Strapless Chiffon Over Satin Beach Wedding Dress is fits greatly and excellent quality. The dress includes inside bra pads. It closure with 5 cm width secure belt in back side. The shape of the bodice is better shaped. Slight sweetheart neckline. There are 4-8 bones on the bodice for evening dress, and for wedding dress there are 11-16 bones. So they can better shows the figure.